What do you get when you mix s’mores, trail hikes, and art camp? 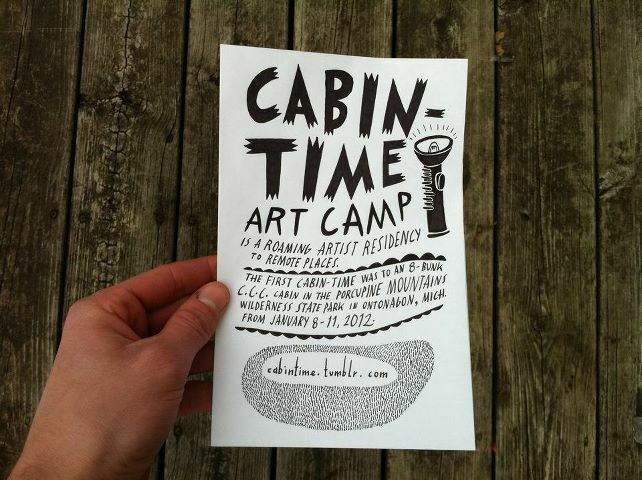 The Grand Rapids-based traveling residency Cabin-Time. In this last Cabin-Time residency, six artists caravanned to the Upper Peninsula where together they made camp fires, tin foil packet dinners, and art. This show embodies all that is promising about the Grand Rapids art scene. While experimental and light-hearted in its premise, the show delivers some visual heft. Although framed by the elemental good stuff of sharing meals, road-tripping and, nature walks, the work avoids sentimentality. This context of a rustic get-away lends the work a certain earnestness as it serves as a record of intimately shared time. The group’s memories of their retreat together are on display, becoming part of our larger collective memory. Queue slideshow. No, really, visit their Tumblr page for photos of their artful venture into the woods. If you haven’t already checked out the show, Cabin-Time: Porkies at Gallery 106, you’ve got until March 16. Featuring the work of Ryan Greaves, Geofrey Holstadt, Colin McCarthy, Drew Melton, Christina Mrozik, Pat Perry, and Sam Snedeker.